Pool members may host an event at the pool, however, prearranged scheduling is required. Visit the Event Calendar to view available dates. To request an event date, please fill out the event request form. Questions? Contact Dave Galway at dave.galway176@gmail.com. We hope you have a great event at Parklawn Pool! We do ask that you respect the following rules so that we can continue to offer parties to all members! Bookings are for three hours only, including party setup/cleanup. If there is another party booked in that space after you, then you must clean the space and vacate the seating. Please build setup and cleanup time into your three-hour allotment and schedule accordingly. EVERYONE who’s not a member needs a guest pass even if not swimming. If the parent is dropping off/picking up there is no charge. It is the responsibility of the host to pay, not the guest. The guest passes you are purchasing for a party are not all-day passes; they are passes for the duration of the party. After the party ends, guests are expected to leave the premises within an hour or pool closing, whichever comes first. You can purchase guest passes at the front desk ($5 each or 10 for $35) or you can pay online. If you pay online (see link under Purchase Guest Passes menu option) there is a pass-through fee, so front-desk purchasing is the least expensive option. The member holding the party must provide a list of attendees to the life-guards before the party so the life-guards can check off the names as attendees arrive. There is a party-size limit of 30 attendees. Parties above that limit need approval from the Board of Directors (BOD). The BOD reserves the right to refuse any party requests. There are two party areas, each designated by a tent. The tents are side by side as the tents are also used for cover during swim meets. However, they represent two separate party spaces. You may request one of the two party areas. The tents are as follows (viewed from pool deck): #1 – far left, #2 – inner left. See map below. If you plan to use the grills, it is your responsibility to bring supplies for the grill, to turn them on, and to clean up after use. Remember, the grills are for ALL members to use, so if you use the grills you must leave room for others to access and share the grills. The pool does not provide labor, tape, scissors, napkins/plates/forks, etc. for party setup. You are responsible for bringing your own trash bags, post-party cleanup, and removing the trash at the end of the party. The guards will be happy to take any excess food you’d like to give to them. You are responsible for making sure that your attendees take the swim test with the guards if they plan to swim in the deep end, and for having parent(s) watch small children who cannot swim. 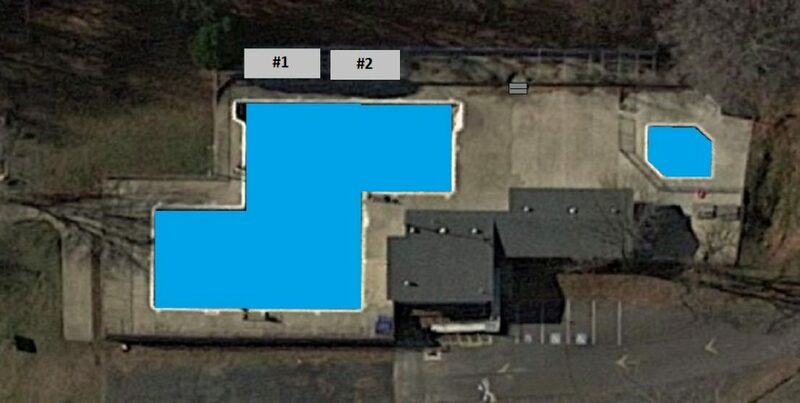 Lastly, please make sure that guests follow pool rules and are respectful of other pool members! Please purchase guest passes from the front desk. Guest passes can also be purchased by clicking on the button below. Please include preferred party area (see number 5 & map under the EVENT RESERVATION INSTRUCTIONS & RULES tab). NOTE: We have had a couple of problems with forms not reaching us. Please check the pool’s calendar within one or two days to ensure that your request has been added to it: CLICK HERE. If you do NOT receive a confirmation email after submitting your request, please let Helen know at hgharris2@gmail.com.